California's Burnt Palms gives us a great revival of more than one style. When I first stumbled across Burnt Palms I tried really hard to pinpoint what type of music they fell under. I struggled to do so because they crossover a multitude of genres within the course of one song. Their ability to mesh garage, punk, grunge, and even pop, is truly a pleasant surprise. While Monterey County, California is not notorious for having the most unified or booming local music scene, Burnt Palms' most recent album – which is a little over 19 minutes – might help to inspire otherwise. 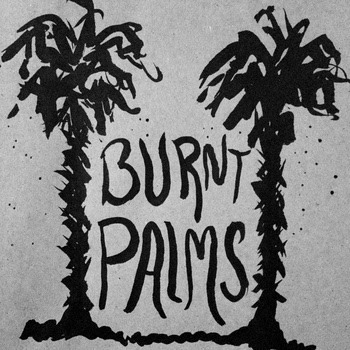 Burnt Palms' self-titled album, which was released this September, is a lively, lo-fi collection of short songs that reek of punk guitar riffs and garage rock melodies. While the California-based band sounds a lot like 90s grunge, the female-fronted vocals of Christina Riley and Clara Neito help to stray from the past scene's male dominated roots and revive it in a new way. "Yours Not Mine" (a definite highlight) starts off the album on an upbeat note as a pop-punk ode to relationships. Next song "Numb One" is much more stripped down with a steady drum beat and noticeable grunge influences. This track as well as later songs "In My Mind" and "Gone" include a lot of distortion and are appropriately angsty/apathetic in their tone and lyrics. On the other hand, fuzzy and more energetic tracks like "Ghost Love", "In The Sand" and "Rather Die" make it very clear that the band hails from the warmer west coast. "Ghost Love" is a catchy tune that rattles about unrequited feelings, "In The Sand" is the perfect song for summer love by the shore, and "Rather Die" has fun riot grrrl undertones and makes me want to bop around at a house show. If we didn't already have a reason to feel jealous of west coasters, now we definitely have more than one. P.S. If you happen to be in area, the three (Christina, Clara, and their bassist Brian) are playing tonight 1/9 in Santa Cruz at The Blue Lagoon. And then again this Friday 1/11 in Monterey at Joe's Underground Lounge. Check them out! Click here to download Burnt Palms.